Written by Ivana McConnell on November 1, 2017 . This feature is available for accounts on the new Google Cloud infrastructure. 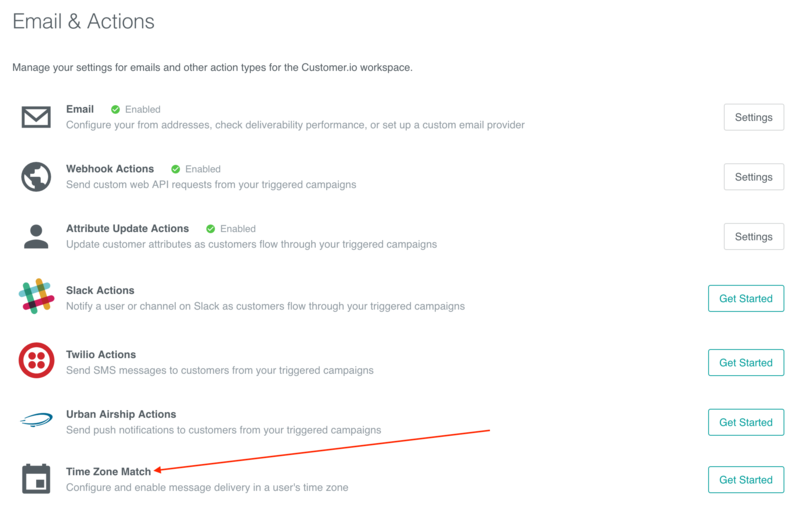 In your Customer.io workflow, time window actions enable you to configure your triggered campaigns to wait until a given day, time, and time zone to send your messages. But what if the customers you want to send your message to aren’t confined to one time zone? You want them all to receive your message “on Monday morning”— but “Monday morning” means something very different for someone in San Francisco vs. someone in London! We want to enable you to send messages in not just in a time zone, but in your users’ time zones! And now you can— with a new feature that we’re calling Time Zone Match! There, you can enable Time Zone Match. To do so, you’ll need to make sure you’re sending us your customers’ time zone data first! Once you’re set up to do that, you’ll be able to turn the feature on, and then get sending in your workflow! Select the user’s time zone, instead of one time zone for everyone! Then, if you disable Time Zone Match in the future, we’ll just set each time window to your fallback. That’s it! Ready to get started? Great! We’ve got a Time Zone Match setup guide for you to help you get going. And as always, if you’ve got questions, feedback, or need a hand, we’re here for you at win@customer.io!